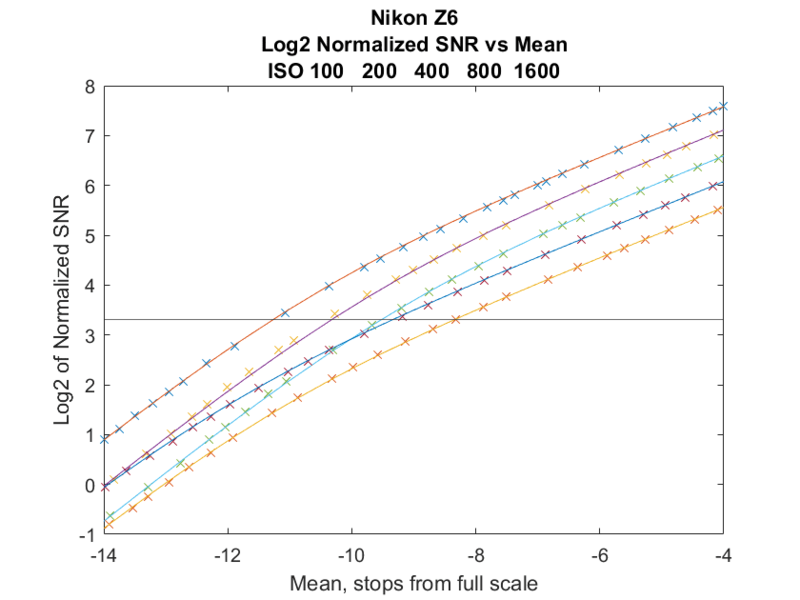 Yesterday I showed you some normalized SNR curves that came from a camera simulator that I wrote to elucidate the relative shadow noise behavior of cameras. Because of the work shown in this post, I am suspicious of those charts, and I’m withdrawing the post until I figure out what went wrong. Because today’s post won’t make sense without some of he preliminary material from yesterday’s, I’m including that information here. I have some bad news: no such metric exists, at least as far as I know. But there is one that may come close, Bill Claff’s photographic dynamic range (PDR). Bill’s metric meets #2 with a footnote about nonlinear noise suppression that I’ll get to in a later post. It meets the next three without qualification. There are excellent hand-waving arguments in favor of its meeting #1, but I think that needs some further exploration. I’m going to be providing that in this series of posts. In a nutshell, Bill computes the Photon Transfer Curve (PTC) from the raw files of the camera under test, converts that to signal-to-noise ratio (SNR) vs mean illumination, and searches for the mean illumination level that produces a SNR of 16000 over the camera’s picture height in pixels. This corresponds to an SNR of 10 for an 8-inch high print viewed with a circle of confusion of 1/200 inch, which occurs at a viewing distance of roughly 18 inches for most people with 20/20 vision. Since most printers have resolutions of 240 to 400 pixels per inch (ppi), to really perform the experiment implied by the metric, you’d have to downsize the image of a modern high-end camera before sending it to the printer. If you used linear methods, that operation performs about the same kind of averaging as the humane eye does, so if you limit yourself in that way, then that part of assumptions is reasonable. It is less reasonable with modern cameras and printers that an 8-inch high print would be the final form of a capture. If that were the case, there would be no reason to purchase cameras with more that about 4 mega-pixels of resolution. The selection of the reference SNR of 10 is fairly arbitrary, but I’m more comfortable with that than the print size assumption. That number has a long history in image processing, which may explain my comfort, but familiarity is not much of a reason for acceptance, so I probably should be a little suspicious of that, too. But do the choice of print size and reference SNR have much an effect on comparisons between cameras? We’re going to explore that here, in the narrow case of two specific Nikons, the Z6 and Z7. It occurred to me that I could modify the photon transfer curve program that Jack Hogan and I wrote some time ago to spit out normalized SNR graphs. I spent all morning coding up the changes, and was rewarded with these two graphs, which are for the first green raw channel. In the plots above, the lines are for the modeled camera in the PTC analyzer, and the crosses are the measured data. As was the case yesterday, the horizontal axis is the mean illumination in stops from full scale and the vertical axis is the log base two of the normalized SNR. The log2 of 10 is about 3.3, and I’ve plotted a horizontal line there that identifies the Claff PDR. I’ve only plotted a few ISOs to keep the graphs from getting too busy. These curves generally agree with Bill’s PDRs for the two cameras, but there are some differences that can be explained by differences in our methods. One important one: I subtract pairs of images before analysis, thereby rejecting noise that is the same from frame to frame. That probably explains most of why I get about 0.2 stops more PDR than Bill does, although there are other possibilities, such as sample variation, camera temperature, etc. 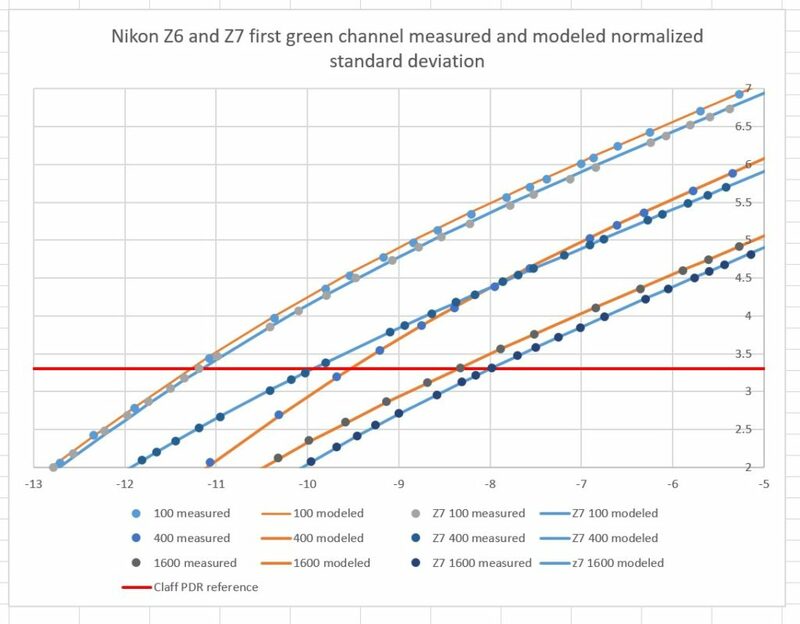 These curves show, better than any presentation I’ve seen, the effect of the conversion gain switching that occurs between ISO 320 and 400 on the Z7 and 640 and 800 on the Z6. You can see that on the right hand side of the graphs that the curves are about equally spaced. That’s the region where read noise makes little contribution to the overall image SNR, and photon noise dominates. Photon noise is not improved by conversion gain switching, so nothing unusual happens at the magic ISOs in the brighter shadows. However, in the part of the curves near the Claff PDR, the read noise is of such importance relative to the photon noise that the curves from two whole-stop ISO settings actually cross, which means that for those shadow densities and lower, you’ll see less noise at the higher ISO. Seems like something for nothing, doesn’t it? It is and it isn’t. Remember that you’re always better off for dynamic range at the lower ISO when you get away from those deep shadows. Now we can compare the Z6 and Z7 on a level playing field. If you look at ISO 100 and ISO 1600, it doesn’t matter much what SNR you pick for a reference, since the Z6 and Z7 lines are roughly parallel. The Z6 is a little better at ISO 100, and better by a larger margin at ISO 1600. But at ISO 400, where the Z7 has switched to high conversion gain and the Z6 has not, it does matter how deep the shadows are. If they are very deep — below about 8 stops down from full scale — you’re better off with the Z7. But if the parts of the scene that are important to you are only brighter than that, than the Z6 is better. The performance at ISO 800 is not shown because it would clutter up the graph, but the differences between the Z6 and Z7 are similar to those at ISO 1600.